Contacting Innotec of WI, Inc.
Everyone is on the move these days and Innotec supports today's climate of ever changing demands. No matter what your needs are they’re covered, that simple. Our team makes the most demanding request and deadlines happen. 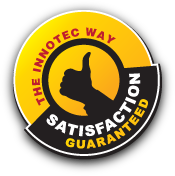 Innotec believes quality customer service is as important as the product. Our front office is made up of knowledgable industry professionals who enjoy and take pride in what they do. You will never get lost in the push button, voice mail dilemma. Why you ask? We simply do not have voice mail. When you call, you will speak to a live person with a commitment to customer satisfaction. Whether your needs are adhesive, paper materials, foams, films, foils or custom slitting and cutting services, call us today and experience an old, but refreshing way of doing business. Contact Us Today by calling or using the form below.